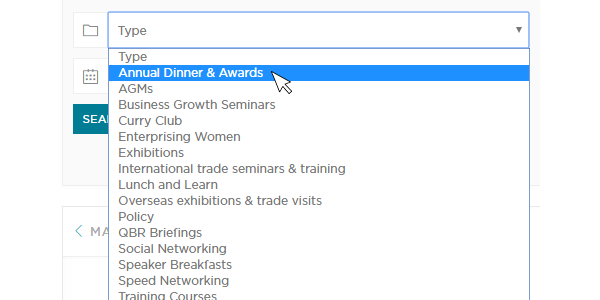 As our events calendar is the most popular feature on our website, we have listened to your feedback and made a few changes. 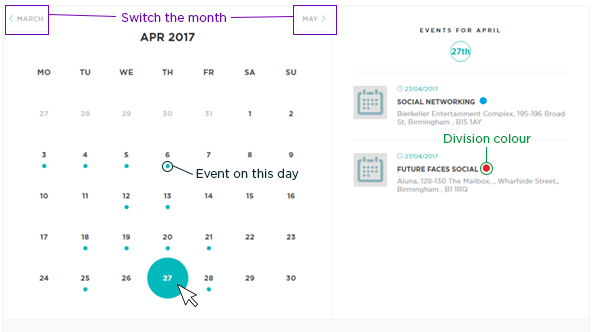 The new and improved calendar features a month-to-view design, allowing you quicker access to event listings for the present month. Switch the month - Clicking left and right allows you to quickly scroll through the months. We have an event! - If you see the teal dot under a date, it means we have an event - or multiple events - on that day. Who is running the event? - Colour coded dots on the right hand side show which division of GBCC is running the event. The example below is for our Future Faces social. We have also added a weekly view if you prefer to glance over events on a week-by-week basis. Click in the top right hand corner to switch to this view. I've seen enough - take me to the new events calendar! We are constantly trying to improve our services and make the user journey better for you. If you have any feedback (positive or negative), please let us know.